Zach Santos Ufkes '18 can hardly remember a time when music was not a part of his life. Last April, Seattle Academy’s Onions placed first in the Reno Jazz festival. Although the Onions have achieved national acclaim, they began with a small group of students who were singing together for fun. City of Angels runs November 1-4. Make sure to come out and benefit not only your classmates, but also yourself! Dennis Bateman & Candace Vance in Relativity at Taproot Theatre. Photo by Erik Stuhaug. On the 5th floor of the STREAM, the phrase “Energy equals mass times the speed of light squared” is repeated over and over again under the watchful eyes of Mark Betnel. Relativity, by Mark St. Germain, puts this phrase in the context of its discoverer, Albert Einstein. Relativity runs through November 21 at Taproot Theater in Ballard. Margaret Harding, a young and attractive woman, pretends to be a journalist for a campus newspaper in order to interview Albert Einstein, in his 70s, during his tenure as a Princeton professor. After some small chitchat, Harding fires impossible questions about Einstein’s past. She interrogates him, slams him for his relationships with his first wife and children, and eventually settles on the issue of his suddenly absent baby girl. It has been stipulated that the girl died as a child, or was adopted by another family, but Harding insinuates the she was abused, causing Einstein to have to justify his obsession with his work over his family. As Harding brands Einstein as a monster, the foreshadowed twist emerges. Could Harding really be Leiserl, the baby girl never seen again after her second birthday? The audience is fully engaged as Harding reveals her true motives, making her more vulnerable than accusative or sarcastic as she had been earlier in the play. This climax truly showcases Mark St. Germain’s range of abilities: smart and witty comedy, heavy and philosophical debates, and eye-gluing, naked character accessibility. 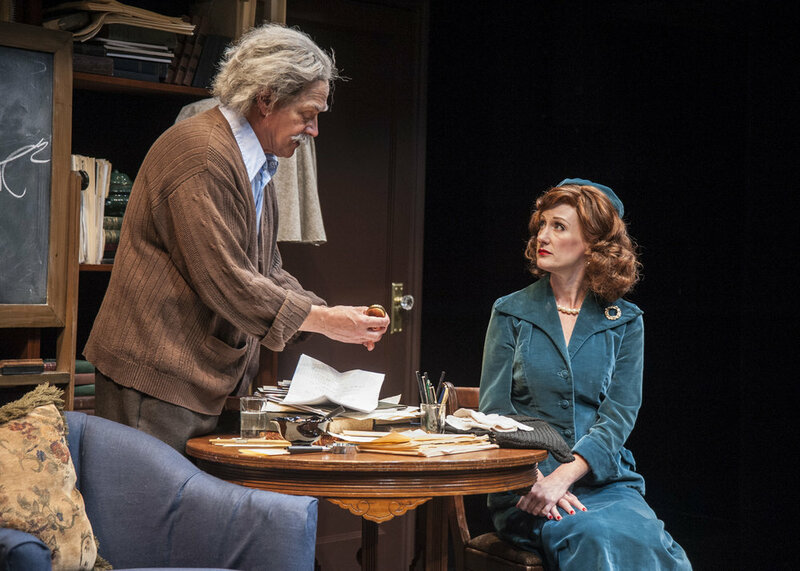 Taproot Theater’s Relativity succeeds in its display of a multi-dimensional protagonist. Einstein, played by Dennis Bateman, embodies the great man behind the Theory of Relativity, as well as the abusive family man, and the snobby and demanding flirt. Bateman portrays a full-bodied character through the clever blend of scientific commentary and heated debate Furthermore, author Mark St. Germain poses many philosophical, thought-worthy questions in the script. Those questions, raised by Harding in her interrogation, center around the notion that “for greatness, there should be goodness.” The audience finds itself asking whether Einstein’s massive contributions to humanity can excuse bad behavior, such as abandonment, sexism, or child abuse. These questions are unanswerable and the debate that ensues between Einstein and Harding is fascinating, but somehow lost in Harding’s shrill, slightly simplistic approach. St. Germain also includes many details about Einstein’s political stances and support for civil rights, throwing them into an already-bubbling character. These details distracts the audience more than they add to Bateman’s performance. Director Scott Nolte could have done away with those lines to focus the play and engage the audience more. With its brilliant comedy, engaging twists, and heated debates, Relativity offers something for just about everybody. Bateman’s performance is also a must-see as Relativity runs through November 21 at the Taproot Theatre Company. On any given day, a handful of Advanced Dance students can be found in the dance studio at lunch, practicing their choreography. These dancers' hard work is indicative of the outstanding leadership of Rhonda Cinotto and Alicia Mullikin, the co-directors of the Advanced Dance class. When most people think of Lily Staton, they think of her starring roles in Seattle Academy’s upper school musicals. Lily excels at theater, but recently she stepped outside of her comfort zone by trying her hand at speech. At age 12, Sydney performed as Maria in West Side Story at the Seattle Opera. Her very first experience with theater, this role would impassion Sydney to pursue theater and singing for years to come. Final dance auditions will be held today, Wednesday, May 24. Contact Rhonda (rcinotto@seattleacademy.org) for details about the final audition. “Blackbird singing in the dead of night.” These were the opening words of “As the Blackbird Flies,” the Vocal Revue show.